Let’s check out some of Naughty Nuri’s latest ‘Stand By You’ campaign from 1st March till 31st May, 2018. #StandByYou campaign will feature three varieties of ever-changing fare, including Naughty Nuri’s signature items such as ‘Ayam Bertutu’, ‘Indonesian-style Nasi Goreng Sambal Kambing’, ‘Roast Pork Salad’ and newcomers, ‘Black Ribs Rendang’, ‘Beef Rendang’, ‘Roast Pork Curry Mee’ and many more. The price of these dishes stoop as low as RM8 to RM15 on a weekly basis for the span of three months. Wah! this Signature Roast Pork Salad is just RM10 omg! It’s very appetizing and refreshing with generous portion of greens, fruits, hard-boiled egg and of course Naughty Nuri’s Signature Roast Pork. I don’t mind going back for more, yumss! This is one of my favourite dish at Naughty Nuri’s, it’ Balinese minced pork BBQ skewered using lemongrass sticks. During #StandByYou campaign it’s only RM10. This satisfying portion of fragrant and flavourful with a hint of spiciness Indonesian Style Nasi Goreng Sambal Kambing. This fried rice comes with flavourful lamb bits, topped with sunny side up and crackers. 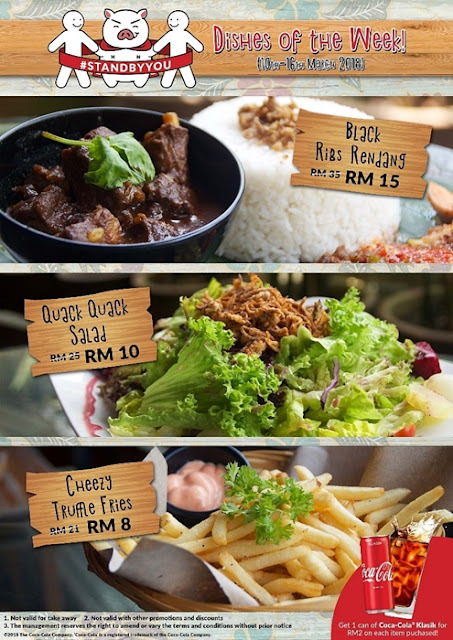 This week you can try out the Black Ribs Rendang at RM15, Quack Quack Salad at RM10 and Cheezy Truffle Fries for only RM8 only. Wow more than 50% savings, what a deal! Now you get to enjoy great food at lower prices during Naughty Nuri’s Stand By You campaign, remember to show your Stand By You All Access Card to enjoy these special price. If you don’t have the card yet, you can try your luck to win the All Access Card through Naughty Nuri’s online contests, or join my giveaway on Facebook HERE! I got 5 Naughty Nuri’s ‘Stand By You’ All Access Card to giveaway just follow 3 simple steps. The ‘Stand By You’ All Access Card was given to the participants during Naughty Nuri's ‘Now Everyone Can Eat’ event that took place in Naughty Nuri’s outlet in SS15 Subang Courtyard recently. More than 500 participants, comprising students and professionals partaking in the Biggest Ribs Eating Event where hundreds of their Signature BBQ Spare Ribs were doled out for patrons to devour. It was truly a sight to behold seeing attendees bring along their favourite plates, of different aesthetics and hues to enjoy the free, succulent, ‘Probably The Best Ribs in the World’. Location: 2, Ground Floor, 20/70A, Jalan Sri Hartamas 22, 50480 Kuala Lumpur. Location: 1, Jalan SS 15/4e, SS15, 47500 Subang Jaya, Selangor. Location: G25, Jalan SS 22/23, Damansara Jaya, Petaling Jaya, Selangor. Location: Lot G-05, Ground Floor, 20, Jalan Sultan Ismail, Kuala Lumpur. Oh yes! I love this dish too. I would like to try Stand By You Naughty Nuri’s Signature Roast Pork Salad too! Looks so healthy and appetizing with essential nutrition! Hi Sherlyn, thanks and see you soon. Hi Hayley, hope you like the pork salad.